It’s a big, scary world out there, and the Monster High ghouls are ready to grab a hold with their teeth! This Scare-Mester, they’re taking some Freaky Field Trips to do some claws-on learning! Toralei, Daughter of a Werecat, will avoid getting wet at the Ascarium. Dressed for a trip under the sea, Toralei looks furrociously fashionable (as usual!) in a red dress with a fish fossil and claw mark print. Strappy translucent shoes and her signature fingerless gloves are the cat’s meow. Plus, Toralei also has two clawesome accessories to com-monster-ate the day: a creepy cool fish skeleton and scary cooling shark water bottle. Fit them onto doll’s hands for freaky fabulous play and display! Collect all of this werecat’s ghoulmates to expand your monster world (sold separately). 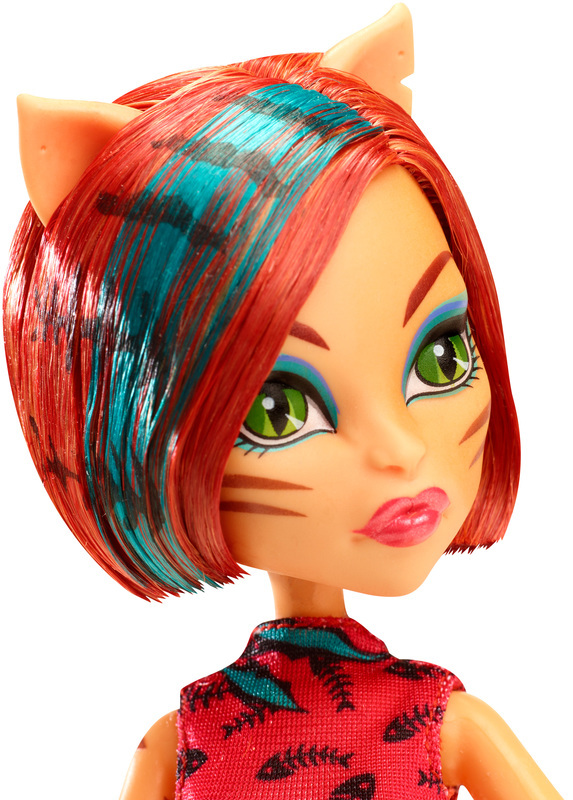 Includes doll wearing fashion and two themed accessories. Each sold separately. Ages 6 and older.